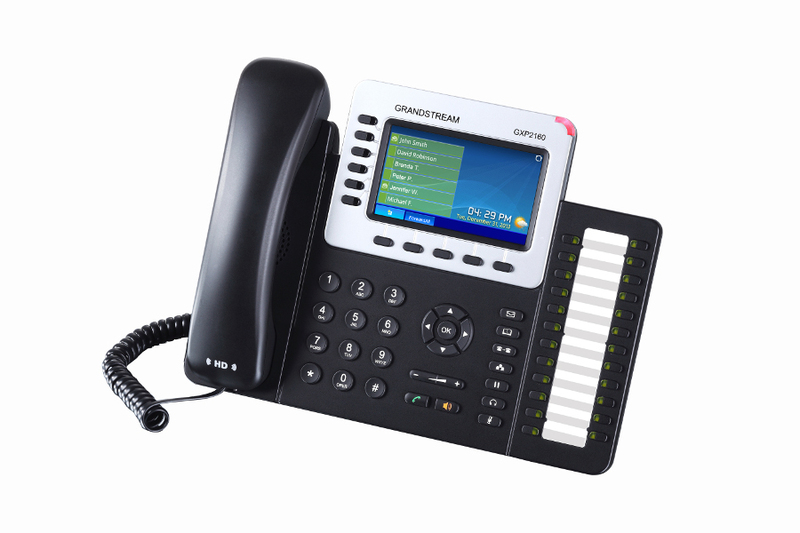 Grandstream GXP2160 ($129) - Cebod Telecom "
A powerful Enterprise IP Phone, the GXP2160 is a Linux-based device with 6 lines, 5 XML programmable soft keys, and 5-way conferencing. HD audio and a 4.3″ color LCD screen create high quality calls, while the 24 BLF keys, Bluetooth, USB and EHS add versatility. The GXP2160 is perfect for Enterprise & SMB customers with the need for quality and versatility in their desktop communications. 6 dual-color line keys (with 6 SIP accounts). 5 programmable context-sensitive soft keys. Up to 5-way conferencing and 24 dual-color BLF extension keys. Automated provisioning using TR-069 or AES encrypted XML configuration file. TLS/SRTP/HTTPS for advanced security and privacy protection.